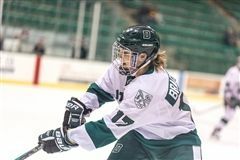 In Burlington, VT last weekend, the Blazers won their first international championship since joining the highly regarded Junior Women's Hockey League (JWHL) in the Blazers' third season, 2008/09. Behind the bench were Coach Sarah Zacharias, Class of 2008, and Assistant Coach Regan Boulton '09. Winning the championship game in overtime versus North American Hockey Academy (NAHA) on March 10, the Blazers ended the 2018/19 season with a historic victory. "All this began more than 200 days ago with an intense week of preseason training," says Zacharias. Defeat NAHA (for the first time in five years). Sweep a JWHL regular season weekend. Finish the regular season as one of the top two JWHL teams. √ Ranked second overall with 30 points. Win JWHL Championship in 2019. √ Won in overtime, defeating NAHA 3-2, on March 10. "By accomplishing all that and more, these 18 student-athletes made their mark on JWHL history, and they leave a legacy for us here at Balmoral Hall," Zacharias shares. On a Friday morning in mid-February, I have created a mobile workspace on the concourse of 3M Arena at Mariucci. On campus at University of Minnesota, home seems far away. I hear sounds, though, which transport me to the memories of my childhood. A frozen puck sliding across a snowy ice surface, a shrill whistle interrupting every so often, and then strong, assured voices calling out to one another as that puck moves from stick to stick again and again. I have never played hockey, but I know the sport well from cheering on my younger siblings for more than 25 years. I have been a BH Blazers Hockey fan for about half that time, since my sister, Michelle, first donned the green and gold in 2007/08. Her teammates that season included Sarah Zacharias and Regan Boulton, who, as coaches of today's Blazers, are now my colleagues at Balmoral Hall School. When they had asked me to join them for a bus trip to Minneapolis, MN for the final Junior Women's Hockey League (JWHL) U19 regular season series of 2018/19, I enthusiastically accepted their invitation. List of 140 news stories. I will never forget the feeling of looking out from the top of Notre Dame Cathedral and the incredible design of its intricate stained glass windows. One thing I will never regret in my life is travelling to Paris to appreciate all the artwork and historical monuments that our ancestors left for us. April 16, 2019 was a sad day. Notre Dame Cathedral, a building nearly 850 years old, a building that symbolized France, was destroyed in a massive fire, which is not only a tragedy for all French people but for all humankind. Exactly 30 days ago, on a school trip to London and Paris during spring break, I was lucky enough to be one of the last few people to go to the top of Notre Dame Cathedral. It was a fantastic experience for all of us who were there because we created so many amazing memories that we will never forget. The total climb was 387 steps. Climbing stairs has never been my favourite thing, but I will never regret climbing those stairs to see one of the most marvellous objects I have ever seen — Emmanuel, the largest bell in Notre Dame. I hope one day in the future it will ring again. 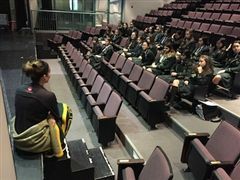 On March 10, 2019, Balmoral Hall School hosted Junior Provincial Debating Championship for Manitoba students in grades 8 and 9. 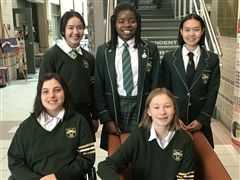 Six very bold debaters representing Balmoral Hall were Kendall Barnes, Megan Burns, Katia Djomo Wongep, Lucy MacDougall, Safiya Ratana, and Lily Rich. These very knowledgeable individuals committed to practices in preparation for this challenging event, as well as maintaining a specialized knowledge in current events at a local, national, and international level. requiring university students to take a mandatory course in gender and culture diversity studies. Congratulations to all the girls on their fine performances. Kendall and Lily qualified to compete at Junior National Championships in Montreal from May 23–26. We are very proud of you! A tournament of this magnitude, with over 68 competitors, 60 judges, 24 speakers and timers, and six tournament organizers is successful only with the support of many people. We know how precious Sundays are and thank you for spending this one with us. Note: The following is a transcript of Marina's opening remarks for Balmoral Hall School's 2019 International Women's Day Assembly, coordinated by the students of Girls for the World. Why is it that there have been so many male Prime Ministers, but only one woman? Why is it that girls just as hardworking and intelligent as we, are not getting equal opportunities? Why is it that women of colour are often excluded from the conversation? Why is it that transgender women are also excluded from the conversation? Why is it that so many people are hesitant to identify as feminist? Why is it that strong-minded women expressing themselves are "unlikable" or "bossy"? The answers are not so clear cut, neither are the solutions. However, these types of questions, the hardest ones to answer, are the questions that have motivated changemakers for centuries. Hard questions were asked in the late 19th and early 20th century when the suffragette women fought for equal voting rights. Hard questions were asked in the 1950s when Margaret Sanger and her supporters fought for women's rights over their bodies and the right to birth control. Hard questions were asked in 2016 when women, including many of us, took to the streets in cities around the world to fight for equal rights, justice, and political representation and continued to do that every year since. With each hard question, a group of passionate, determined, radical, inspiring individuals of all genders and identities have worked to respond with purposeful action. On March 1, 2019, Davina, Alyssa, Carol, and I had the amazing opportunity to travel to London, Ont. to compete in Ivey's High School Case Competition. As soon as we arrived, we took a campus tour of Western University led by a Western student. We saw examples of lecture halls, the recreation building, and Western's largest library, in addition to learning more about life at Western and the many opportunities offered there. The highlight of our trip, however, was the Ivey case competition that ran all day Saturday. The day began with an interactive lecture based on how to analyze a business case. We were then separated into teams with five other students from different schools across Canada and given a real-life business dilemma. With three hours to work, we analyzed the case considering aspects such as financials, consumers, and competitors with the help of an Ivey student and then presented our decisions to a panel of judges. Davina's team competed in the finals and placed 3rd overall with their case! 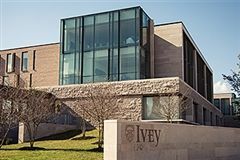 This was an incredible opportunity as we explored the case method of studying business, which gave us the hands-on approach to learning for which Ivey is famous. We were pushed to confidently express our ideas in an unfamiliar yet supportive setting, giving us an authentic perspective of what an education (and then a career) in business would entail. After learning a great deal from the Ivey case competition this year, my desire to consider pursuing business in the future is even stronger. JWHL playoffs will occur March 8–10, 2019, in Burlington, Vt.
’Twas a late night for the Blazers, who were scheduled to play the New England Hockey Club at 9 p.m. Saturday. And yet, the game, once again at 3M Arena at Mariucci on-campus at University of Minnesota, started just before 9:30 p.m. The Blazers conquered their fatigue for a 6-0 victory, with the shutout to netminder Megan Schroeder, who faced only 11 shots. Scoring for the Blazers were Olivia Cvar (2), Karine Sandilands, Dana Goertzen, Chelsea Krahenbil, and Chiara Esposito. In their final game of the 2018/19 regular season, the Blazers will play Ridley College Sunday at 9 a.m. Fans were treated to a nail-biter this afternoon at 3M Arena at Mariucci as the Blazers faced the Boston Shamrocks, winning the game in the final two minutes of the third period. Much of the game involved the two teams trading power plays and penalty kills. After 40 minutes, both had scored twice, with Olivia Cvar and Dana Goertzen scoring for the Blazers. With 1:59 remaining, the Blazers called a time-out, trailing 2-3 at that point, and pulled goaltender Shayna Moore for an offensive face off that resulted in a beautiful goal from Cvar, assisted by Alix Yallowega, with 1:51 remaining. Yallowega then tallied the game-winning goal herself, assisted by Cvar and Chelsea Dinnin, 35 seconds later. The Blazers play the New England Hockey Club late this evening. The BH Blazers U19 hockey team is in Minneapolis, Minn. for the final series of the 2018/19 regular season, ranking second overall in league standings at the start of the weekend. This morning, a hard-fought battle versus the Ottawa Lady 67’s ended in a 4-4 tie after a late goal from the 67’s sent the game into overtime. After five minutes of 3-on-3 hockey, however, both teams remained scoreless. Veteran goaltender Megan Schroeder made 32 saves, and, on the opposite end of the rink, Chelsea Dinnin, Alix Yallowega, Rebecca Thiessen, and Olivia Cvar scored for the Blazers. Next, the Blazers will face the Boston Shamrocks tomorrow at 1 p.m.
Last month, Cella Rousseau '11 came to Balmoral Hall and spoke with the Grade 8 class about her career and life path. Ms Rousseau is a BH lifer who grew up here and adored activities such as voice and drama. She has always been a storyteller and loves to make people laugh. School helped her embraced those talents and her creativity, which led her to Creative Communications at Red River College, where the groundwork was laid for her career as a writer. Ms Rousseau said it was a great program for her, and she majored in journalism. True crime journalism became her passion, and she was able to have a few crime stories published. Then, an exciting journalism opportunity arose for Ms Rousseau with Winnipeg Sun. She loved her job there, but, after a while, she wanted to try something different. Around that time, positions at iMore, a tech journalism company, opened. This sounded interesting to her because it required her to review photography products. She found her job fun and interesting, and she loved playing around with the new "toys." Not long after, she was invited to attend a consumer electronics show to review some of the products there. That ended up being the place where she really figured out what she wanted to do as a career. After the show, she realized that she had found a new passion for technology, as she loved to review and test gadgets, but she kept thinking of even more ways she could share her creative abilities with the world. 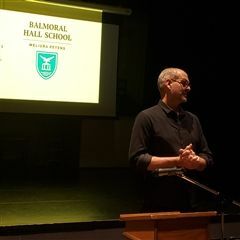 The school community gathered in Sifton Family Theatre on November 14, 2018 as presentations were delivered by Ms Nancy Cipryk '86 and Mr. Jim Perchaluk (pictured) at a joint annual general meeting hosted by Balmoral Hall School's Board of Governors and Balmoral Hall School's Foundation. 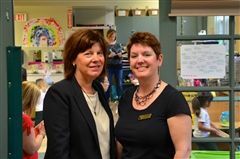 "What an exciting time to be at Balmoral Hall School," said Ms Cipryk. "At this time last year, we shared our new strategic vision with ambitious goals to become a globally recognized and trusted brand, build an unlimited learning community, and create a culture of philanthropy and financial sustainability. That strategic vision has allowed us to see ourselves like never before." The 2017-2018 Annual Review is available online. Debate at Balmoral Hall School is a competitive team sport. In fact, our debate community continues to grow each day. Our debate prefects, Barrett and Megan, began the year by introducing a new club called TableTalk. TableTalk provides students with opportunities to express and modify their ideas on current issues such as the potential of opening Portage & Main, the benefits versus the harms of surveillance cameras, and police carding. Barrett, with support from senior debater Lindsay, leads another speaking opportunity for students learning English as an additional language to practice their communication skills during Language Learners on Wednesday mornings. Finally, there are the students who battle with words in challenging competitions and are constantly preparing for the next tournament. Our junior and senior competitive teams meet multiple times each week to develop their understanding of precedence, analyze the rationale for the decisions that our government leaders make, and question the advantages and disadvantages of implementing new resolutions in our current evolving society. The junior team members are especially eager to work with their senior team mentors, Lauren, Lindsay, and Irina. We are a debate family, and together the team laughs and learns during early morning meetings, working lunch-hours, and evening verbal "jam sessions." Taking risks is something that debaters do consistently, and our students have established themselves as strong competitors at several tournaments since September. We encourage you to join us at our future tournaments as a competitor, speaker, timer, observer, or judge, including the Rupert’s Land Debate & Public Speaking Tournament on December 9, 2018. (Register here as a judge.) Join the debate team, and bring the power of argumentation, refutation, and consideration of opposing viewpoints into your everyday life. 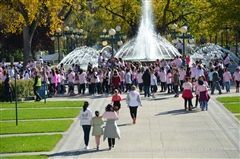 In 2001, BH girls joined hands and hearts for the inaugural Girls for the Cure, many walking in memory of friends and family, with funds raised directed to CancerCare Manitoba Foundation in support of breast cancer research, treatment, and patient care. Since then, the Balmoral Hall School community has raised more than $410,000 for women's cancer over the course of 18 walks. On October 30, 2018, at the 27th Annual Guardian Angel Benefit for Women's Cancer, Head of School Joanne Kamins accepted the Great-West Life Award of Distinction on behalf of all Girls for the Cure participants. "Without your participation, generosity, and encouragement over the past 18 years, we would not be receiving this wonderful recognition," she said. "CancerCare Manitoba Foundation and the Guardian Angels value our long-time relationship with the students and staff at Balmoral Hall School, and we congratulate you on your outstanding achievement." Last Friday, Sep. 28, Grade 8 had a special visitor who came to class on Orange Shirt Day. Vicky Catagas is an Indigenous woman who was in the Sixties Scoop along with her brothers and sisters. During her visit, she talked about the story of what happened to her during and after the Scoop. While she and her siblings were playing, a group of RCMP officers came and picked them up and put them with a foster family. Vicky talked about how the foster family took their culture away from them by cutting their hair, telling them it was full of lice and bugs, and not allow them to speak their own language, though that was the only language they knew at the time. The foster family continued to tell them lies about their former family, and once she reached the age of 18 she was kicked out of the home with only $50 to build a life of her own. My Grandpa, Captain T. Palmer, came to visit Grade 5 on Sep. 17, but he is not the only one to make a safe landing in this school. His sidekick (that's me) started at Balmoral Hall for the first time this year, and it has been a smooth flight ever since. I like it all – my classes, the playground, and my new friends. Captain T. Palmer talked about many things. We are studying weather so he showed us a PowerPoint of diagrams and pictures of how weather impacts his job. He even left a book about aviation and meteorology for us to look at. He also told us the story of Khun Pao, the first female pilot in Thailand. Balmoral Hall School, a private boarding school for girls in Winnipeg, has broken ground on a $6-million initiative it hopes will land more young women in science, technology, engineering and mathematics fields. Construction began Thursday on an 18,000-square-foot building, which will serve as a centre for arts and design. "It’s a journey we started about five years ago, and after a winding journey, here we are today, breakingground," Joanne Kamins, head of Balmoral Hall, said on Thursday. Read the rest of this story on the Free Press website. 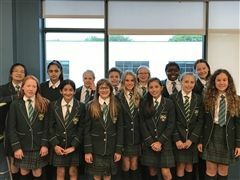 Congratulations to all Junior Novice Provincial Debate competitors who participated in the provincial tournament on May 31, 2018. 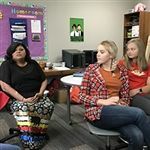 They became experts on the benefits and disadvantages of streaming students in classes based on ability, They noted that it would be very difficult to make a decision about how to structure classes if they were the school administrators because there are positives and negatives for each option. This tournament was the culmination of the debate season. All those who competed in this tournament were in their first year of debate, especially grades 6 and 7 students. For many enthusiastic participants, this was their very first tournament. Debate is a challenging sport of critical thinking in the moment, the agility of thought, respectful disagreement, persuasive language, and passionate discourse. These debaters truly displayed the attributes of a BH graduate. Well done, girls! Congratulations to Grade 6 student Zelal Emre, who received the John Robinson Top Speaker Overall award! 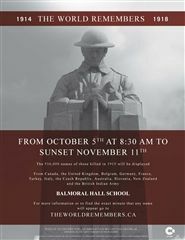 Starting in January, Grade 6 students complete an in-school heritage fair project, and then select students represent Balmoral Hall at Red River Heritage Fair, which occurred May 3, 2018. 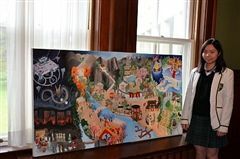 Reagan Jaworski received The Manitoba Historical Society Award for her project on The Grey Nuns & The Red River Settlement, and, also, she was featured on an affiliated Grey Nuns website, presented to them earlier this spring, and is expected to do so again in the fall. 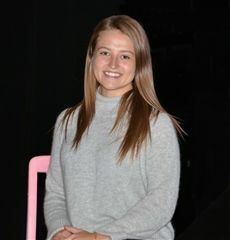 Anneliese Gasmen received The Red River Heritage Award of Excellence for her project, To Reign: Canada’s Constitutional Monarchy, placing her in the top three overall. Both students attended a reception and awards ceremony on June 6 celebrating Red River Heritage Fair at Government House as guests of Her Honour the Honourable Janice C. Filmon, C.M., O.M. Lieutenant Governor of Manitoba. Congratulations to Anneliese and Reagan! In partnership with St. Paul's High School, we entered two teams in the Ultimate provincial championships, each made of up both Balmoral Hall and St. Paul's students. May 26-27 was a great weekend of highly competitive Ultimate, and both teams represented our schools very well at Winnipeg Ultimate Park at Maple Grove Park. For the first time in the program's 10-year history, both teams played in a divisional final. 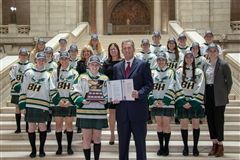 The BH Blazers played in the Provincial B-Division final, while the St. Paul's Crusaders managed to win their way to the Provincial E-Division final. Just prior to Victoria Day each year, Balmoral Hall students participate in student-led conferences. 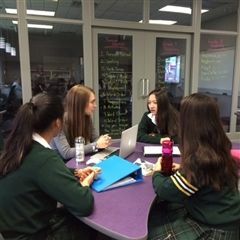 For many BH girls, this is an opportunity to participate in time-honoured traditions such as Grade 5 Exhibition, Grade 10 Passion Projects, and Grade 11/12 Panel Interviews. These are important milestones in a BH girl’s academic journey. What they all have in common is their evidence of science, technology, engineering, arts, and mathematics (STEAM) inquiry. Grade 5 themes of inquiry included explorations of basic rights, how those rights are denied or enforced, and actions that promote or deny equality of rights. Students considered the following central idea – negotiating rights when sharing resources impacts behaviour – in preparation for their Exhibition, “Doing the Right Thing,” which occurred May 16. Also, on that date, they organized Learn with a Stuffie Day; whereby donating a minimum of $1, Junior School students supported a Canadian charity, Sleeping Children Around the World. In addition to a multimedia presentation in Sifton Family Theatre, the Exhibition included a solutions symposium of interactive displays, as well as a glow-in-the-dark museum within the dance studio. Parents: Click here to access photos and videos from the Grade 5 exhibition via Vidigami. 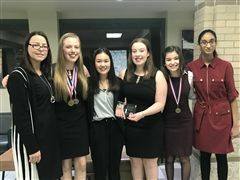 The provincial finals for the French speech competition, Le Concours d'art Oratoire, were held on May 5 at Université de Saint-Boniface, and BH girls did very well! Anna Rose Dornetshuber participated in this category, as well. Since the beginning of January, the Grade 8 science classes had been hard at work on our science fair projects. We spent hours researching, hypothesizing and experimenting. In the end, we placed all our hard work upon our backboards and presented them to our classmates and families, Mr. Zimmerman, and invited guests. 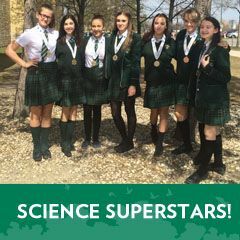 Eleven Grade 8 students were chosen to attend Manitoba Schools Science Symposium from April 26-29, 2018. On Thursday evening, we registered and set up our projects. The opening ceremonies were held on Friday morning, followed by science activities for the remainder of the day. Saturday, our projects were presented and judged. Sunday was public viewing, followed by award presentations and closing ceremonies. All BH girls left with an award! On May 1, Olivia Wilde, Megan Schroeder, and I had the pleasure of attending and competing in the 2018 Cyber Defence Challenge, which combined simple logic puzzle solving with sophisticated programming aimed at finding security flaws in a fake company's website. The day was further enriched by the overarching story plot involving a corrupt business, government schemes, and fake news. Throughout the day we were able to explore in great detail what made a website secure, how to improve general cybersecurity in our own lives, and how to deal with the demands of an employer. Whilst the day was both immensely entertaining and very educational, we were not mere attendees but competitors of the challenge, consisting of searching for "flags" amidst hints given by our table mentor and the officiators of the competition, which would secure points for the team. Additionally, we prepared a seven-minute presentation to a panel of board members of the company we were working for about the security of the website and our advice to improve it. 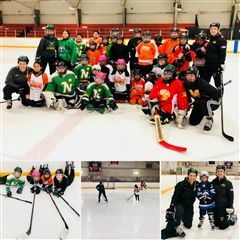 During the last weekend in April, BH Blazers Assistant Coach Regan Boulton '09, along with current Grade 11 student and Junior Women's Hockey League (JWHL) All-Star Kennesha Miswaggon, and I visited the northern Manitoba community of Cross Lake to host a developmental hockey camp at no cost to participants. To top off the tremendous success of the debate team this year, Natasha Hofer and I qualified to represent Manitoba at National Debating Championships this year in St. John’s, Newfoundland. Six hours of travel time to “The Rock” was well worth it. Experiencing top quality debating, exploring a province we had never visited before, and meeting debaters from across Canada made the competition one to remember. The rounds of impromptu resolutions included topics involving pre-election polls, humanitarian aid, the acknowledgement of sexual minorities, fake news, and more. This year, for International Day of Pink, April 11, Rainbow Club decided to start a full school initiative to create a collage expressing the mission of this day: "to unite in celebrating diversity and raising awareness to stop homophobia, transphobia, transmisogyny, and all forms of bullying." This project was inspired by a previous poster made by club members. We selected a word for each grade, and they had the task of creating an image to represent that word. These images were then placed on a large poster in the shape of a pink t-shirt and displayed in front of the school. With this project, we were able to raise awareness of the issues surrounding International Day of Pink throughout the school community, such as equality, diversity, and respect. We were amazed by each grade's creativity, passion, and perspective on these important issues. On Saturday, May 5, Grade 11 students Brooke Antman, Marina Levit, Nikayla Little, Emma Joyal, Dores Shenouda, and Jessica Sui will be joined by Members of the Legislative Assembly Mr. Rob Altemeyer, Wolseley, and Dr. Jon Gerrard, River Heights, to host a forum on environmental issues. 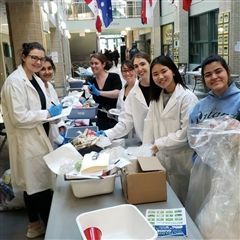 This student-led event, Project Green, aims to engage members of the community in learning about environmental issues and taking action towards bettering our local and global society, says Jessica, one of six student organizers. While the rest of the school community was away for spring break in late March, the two-, three-, and four-year-old girls of Balmoral Hall discovered countless joys of learning as the campus was theirs to explore. From camping out in a Reggio-inspired play area designed by BH Beginnings child-care staff to painting in the (quickly disappearing) snow, educational opportunities throughout these last two weeks were especially playful! They experimented with light, along with colour, through a variety of in-class experiments, too. Yoga was on their timetable, as well. "I think what I am most impressed by, what is such an important aspect of the Reggio Emilia approach, is the time spent in discussion or examination," says Director Simone Penner. "These learning activities begin with dialogue, followed by research. We know that children are capable of extraordinary insights; they need opportunities to question, imagine, and create." This year's International Women’s Day assembly was a huge success! Girls for the World spent months planning and preparing for this event. I was proud, as Global Issues Prefect, to see it all come together so smoothly. For the assembly, we invited Hon. Heather Stefanson '88, Andi Sharma '03, as well as entrepreneur and musician Odette Bahati, to speak to us on what it means to them to be bold. In late February, Natasha Hofer, Lindsay Cogan, and I travelled as a team to Bermuda to compete in our first international debate and public speaking competition. The tournament in Hamilton included two days of public speaking and one day of debate. In the public speaking half, Lindsay and Natasha competed in the interpretive reading category, I competed in the impromptu speaking event, and we all participated in the persuasive speaking category. Individually, Lindsay placed first in persuasive speaking, in interpretive reading, and she was the top individual speaker in the senior division; Natasha placed second in persuasive speaking, and I placed first in the impromptu speaking category and fourth in persuasive speaking. Finally, in public speaking, we were recognized as the first-place team overall. 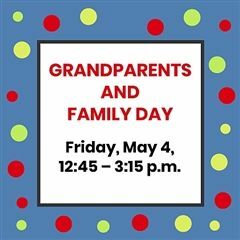 YOU'RE INVITED TO GRANDPARENTS & FAMILY DAY! so please join as we highlight student achievements and share their classroom experiences. Balmoral Hall School's Arts Exhibition on Valentine's Day included a silent auction of Senior School students' works of art created "live" that evening. 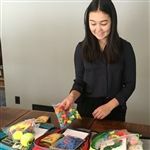 Click here to view a brief interview with Grade 11 student Marina Levit, conducted by Jessica Sui, who is also a Grade 11 student. 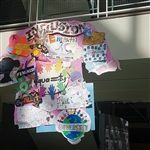 Students' work was later displayed in the atrium. With the auction ending February 26, final bids on 15 outstanding paintings totalled $1,010. With 50% of all proceeds benefitting the students themselves, and 50% to be donated to our Centre for Arts & Design campaign, your support for the arts is appreciated by the full school community. Imagine the impact this will have on BH girls! On their behalf, thank you! On February 9, Dr. Bea (Nichol) MacKay '62 visited Balmoral Hall to discuss her career with us. She has a Ph.D. in Psychology and works as a counsellor. With her, we participated in conflict resolution. We each choose a problem in our own lives, such as, "I really want to do well on a math test, but I do not think I can." We then had a conversation with ourselves to come up with solutions. 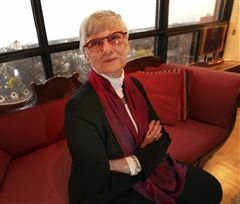 Dr. MacKay has two sons, and she revealed that they have influenced her life. She really likes her job, because she sees how the people she works with change and become happier. Dr. MacKay also talked about self-esteem as a byproduct of how we handle ourselves. She told us that it is how we think that really matters. Currently, Dr. MacKay is starting to work as a sports psychologist, and she is working on her second book. Without the support of Balmoral Hall Parent Association (BHPA), Wellness Week, January 29 to February 2, 2018, would not have been possible. We are truly grateful for their continued support of this important full school event, which is organized by our Centre for Learning faculty and staff. In just a few years, we have evolved from hosting Wellness Day to celebrating Wellness Week. So, you may be wondering what that looks like. Imagine more than 500 BH girls having daily conversations about wellness, including physical, mental, and spiritual health. Recently, Julie Clark '09 returned to Balmoral Hall School to talk to Grade 8 students about her unique career. After graduating from Balmoral Hall, she attended university in Wilford, Ont. Julie says that she is not necessarily cemented into one specific career, and she even told us about how she believes there are always roads ahead and behind us. To demonstrate her point, Julie also told us about teaching English classes in Seoul, which she later stopped because she found it difficult to plan her lessons. Although Julie abandoned her career as a teacher, it is safe to say that all Grade 8 students, myself included, learned some very valuable lessons from her inspiring stories. She taught us about how she realized that little worries are not the same as big problems, and another thing we learned is that someone always has it worse than we do. 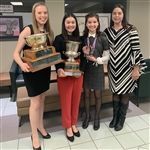 In late January, Victoria Stefanson, Yu Chen (Zoe) Zhang, and I travelled to Ivey Business School at University of Western Ontario to attend their High School Case Competition, where students read business cases and make action plans to solve problems. There were 80 students who attended this year. During the introductory session, an experienced business teacher went through the sample case to give us a brief idea about the case study. He added some tips for the later presentation, as well. After this tutoring, we were assigned to different groups. I worked with five other students and a team leader who is a student at Ivey. The case was about Porsche Canada. Porsche wanted to weave a winter driving message into its social media to encourage more people to buy their cars in the winter. We analyzed the case and made an action plan for the problem. Most of the students who came to the competition had some experience in business courses. I felt very nervous about my lack of experience. In the group discussion, I also realized the gap between my peers and me when I heard the business vocabulary blurted out by my team members and skillfully used in some case analysis techniques. I tried my best to join the discussion and plan the solution with my teammates. Brenley Shapiro, a Cognitive Behavioural Psychotherapist and Certified Mental Game Coach with Heads Up High Performance, based in Toronto, Ont., shared her insights for strong, powerful, and productive thinking with members of the school community last month as part of a series of workshops scheduled at Balmoral Hall throughout Wellness Week, January 29 to February 2, 2018. 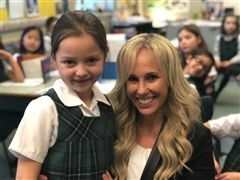 Her lunch-and-learn workshop with parents and faculty reflected the theme, "Inspiring Greatness," whether inspiring greatness from within or inspiring greatness within others. All participants gained valuable insights and understanding with respect to the role that mindset plays in generating success, as well as the key features involved in developing that mindset and breaking down barriers that impede it. Such was the focus of her talks with Middle and Senior School students, as well. Kathryn Marcynuk '07, a Ph.D. candidate in computer engineering recently spoke with Grade 8 students about the work she does and how she got to where she is today. She explained that doctoral study requires pushing the boundaries of human knowledge because you love learning. According to Kathryn, one of the perks of being a grad student is that you are the master of your domain. There are many job opportunities to challenge yourself. However, she also said that the most difficult part of the process is self-motivation because she does not have a boss or a teacher. In addition, Kathryn talked about her area of research: statistical signal processing. At first, she did not know what she wanted to do when she grew up. In fact, she had no idea that computer engineering existed. All she knew was that she was interested in computers. She said, “You navigate your way as you learn more,” which was exactly what she did, earning multiple degrees and discovering her passion for computer engineering. Last week, Grade 4 had a very successful STEAM Day event based on their current International Baccalaureate (IB) Primary Years Programme (PYP) unit, "Rocky Landscape." Their excitement built as they put on their “Super STEAM Sisters” t-shirts in preparation for a full day of learning in science, technology, engineering, arts, and mathematics. Each letter in the STEAM acronym was covered throughout the day by students participating in five different stations. The "S" for science station was a mineral experiment. While at the "T" for tech station, students broke geodes open and created an iMovie project about their discoveries. Ms Kirstan Osborne facilitated the "E" for engineering station, designing and building catapults. Marbled rocks were the product of the "A" for arts station. "M" for math meant measuring and weighing mock rocks prior to dissection. Just for fun, this day was made extra special by rock-themed snacks and the singing of their “Super STEAM Sisters” song, written for the previous STEAM Day. Students look forward to their next STEAM Day in the spring term, which will focus on the IB PYP unit, "Circle of Life." December seems to be a time of giving. We know intellectually that there are people in need all through the year; however, at a time when many receive so much the disparity is far more apparent. December in Junior School was an opportunity to reflect while offering time plus donations in a variety of ways. We chose to focus on the organization You Can’t Spoil A Baby, which was created in 2011 to help families during a baby’s first year. Each grade collected specific objects, necessary to ensure the comfort and health of babies in our community. 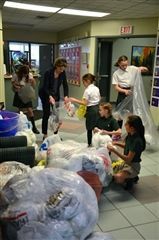 In addition, Grade 5 BH girls hosted a toy sale and donated the money they raised to the organization to purchase much-needed items. This is the guiding principle of academic language teaching and learning at Balmoral Hall School. In each of half a dozen classrooms, you will find 10-15 international boarding students expanding their knowledge as English language learners for at least two hours on Saturday mornings. These BH girls, from grades 6 to 12, are preparing for their chosen post-secondary pursuits. April 1992: The inaugural Rupert's Land Tournament is held at Balmoral Hall in honour of the school's 90th anniversary. December 2017: Students honour a legacy of debate and public speaking, competing in the 25th annual tournament. In 25 years, much has changed at Balmoral Hall School. The scholarly pursuit of excellence in impromptu and persuasive speaking, as well as parliamentary debate, however, remains. Last Sunday, Dec. 3/17, this was certainly evident among those involved, from competitors and coaches to judges and spectators. This year, we are taking Visions & Ventures as our elective class. The course focuses on entrepreneurship, emphasizing what skills and attributes are necessary to be a successful entrepreneur, what is important to consider when looking for business opportunities, and what factors to be aware of in order to successfully create and run a business. We have had many amazing guest speakers in our class this term, and, after taking advice from them, we have been preparing to launch our first joint business venture, A Holiday Pop-Up Craft Sale! 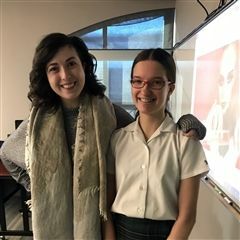 In late November, Madison Maidment '11 visited the grades 9 to 12 students to give a presentation on preparing for a career in a field that may not yet exist. 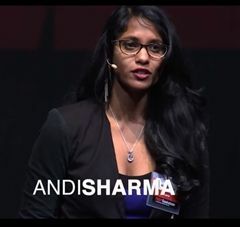 In the winter of 2016, she began working at coworker.com, which connects people and companies to coworking spaces around the world. The idea of coworking is still incredibly new to us, yet it was virtually nonexistent when Madison graduated from Balmoral Hall. With studies showing that about 65% of the jobs we will have are not invented yet, it is critical that students are taught how to prepare for such jobs. The main advice Madison had for us was to learn something from all classes, even if it is not the content of the course. The example that she gave came from a university religion class. Even though the subject of religion may not come up in her day-to-day life, the skills she took away from that course allowed her to write more creatively, make deeper connections with those around her, and increase her global awareness. Madison also spoke about how her educational experience enabled her to be innovative. Throughout her presentation, it was evident that Madison was passionate about her work. She also mentioned the importance of finding what you love to do and creating a career around this. Though Madison did say that there is a lot more she wishes to accomplish, her story of finding success in a relatively unexplored field relayed an incredibly important message. Ella Thomson, who graduated from Balmoral Hall School as a lifer in 2013, received the Order of the White Rose in a ceremony in Montreal earlier this month. She received the scholarship, a necklace, and 14 white roses in memory of the young women who were killed on Dec. 6, 1989. On November 13th, the Grade 8's had the opportunity to listen to a talk by Sarah Zacharias, acting coach of the BH Blazers hockey team. CBC has released their listing of the Manitoba Future 40. Two BH Alumnae, Iqra Tariq '16, and Carmyn Aleshka '96 have been recognized for their dedication and innovation. We are so proud of them, and all our alumnae for their many achievements. Iqra is a Winnipeg born Pakistani Canadian who is a second year science student at the University of Manitoba taking pre-pharmacy requisites. She is the current Media Director at the University of Manitoba’s Muslim Student Association. 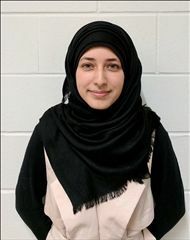 A passionate learner, volunteer, and Balmoral Hall alumna, Iqra participated in provincial science fairs for the majority of her schooling and was a nationals finalist at the Canada-Wide Science Festival in 2016. In October, Balmoral Hall School, along with 120 students and staff from Mulvey School, participated in our annual Girls for the Cure fundraising walk. We were thrilled to present a cheque to CancerCare Manitoba for $19,687. That brings our total donations to $408,500 in 17 years! Thank you to all students, faculty/staff, and family for your donations. Each and every penny counts in helping to find a cure for cancer. Jessica Sui (Grade 11) and I had the incredible opportunity to represent Balmoral Hall on a student panel at the Canadian Accredited Independent Schools (CAIS) Heads & Chairs conference in Winnipeg from October 15–17, 2017. We were joined by two students each from Gray Academy and St. John's-Ravenscourt. As panelists, our role was to share insights regarding independent schooling. 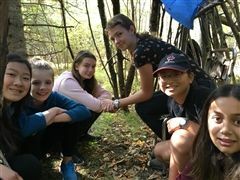 In late September, I had a blast attending a Canadian student leadership conference along with three other BH girls in Waterloo, Ont. as this year's theme was "Ignite Your Innovative Spirit." During the five days of CSLC, I had the opportunity to listen to many amazing speakers who have now inspired me to take action in my own community. I also participated in workshops, explored Waterloo as well as Kitchener, visited universities, celebrated the German heritage of Kitchener at Oktoberfest, attended a TED talk, volunteered at a local food bank, went to a horse auction, made new friends while reuniting with old ones. Being in the communications office offers a unique opportunity. On any given day, a three year old will be discovering the hidden picture in a collection of shells, blocks or beads in our Child Care room, someone in grade six will be using a Dremel tool to buff the edges off of her most recent 3D model, and a student in AP Chemistry will be seeing the results of her calculations come to life before her eyes. Beyond our halls, accomplishments by our alumnae become a steady flow of examples for our BH girls to look up to. In recent years, the importance of taking some time away from the rink has been preached by players and coaches alike. The belief is that players can wear themselves out playing one sport for 10-12 months of the year, resulting in what is known as burnout (a.k.a. "overtraining" or "overuse injury"). Allowing players to have some time away from one sport to focus on another is great for motor skills, furthers skill development in different areas, and overall gives players a chance to yearn to get back on the ice, which is a feeling every coach wants for her players. At Balmoral Hall, we encourage our athletes to hang up their skates now and then to enjoy some of the other sports the school has to offer. The Blazers have seen players compete in cross-country, track and field, volleyball, basketball, badminton, soccer, and ultimate. After Katie Campbell suggested it, and her peers wholeheartedly agreed, Mrs. Greenwood's Grade 11 Advisory Group has set a goal to connect with Mrs. Thomson's Kindergarten class throughout the year. The first visit occurred today when the Grade 11s brought over a fall craft for their Kindergarten friends to try. The Grade 11s, according to Katie, would like to be role models for the younger students as someone they see in the halls to build a connection with, creating deeper bonds within the Balmoral Hall family! From September 18–22, Middle School classrooms were emptier than usual as students in grades 6, 7, and 8 participated in a delightful Experiential Learning Week. This was a unique opportunity for BH girls to learn by doing as they visited sites such as Manitoba Museum, St. Boniface Library, Art City, Oak Hammock Marsh, Siloam Mission, Neechi Commons, Winnipeg Art Gallery, Mentoring Artists for Women's Art, and more. Additionally, guest lecturers, such as software developer Serena Vandersteen, brought their knowledge and expertise to Balmoral Hall with a variety of in-class presentations. Varsity volleyball league play began this week at Calvin Christian Collegiate. The BH Blazers played a strong game but ultimately took only one of five sets. Their next game is on Tuesday, Oct. 3 when the Blazers will play an exhibition match against Sanford at home at 5:30 p.m.
Their next league game is Wednesday, Oct. 4, when they will play Linden Christian at home with a game time of 6 p.m.
Support BH girls by coming out to watch Blazers volleyball in action! 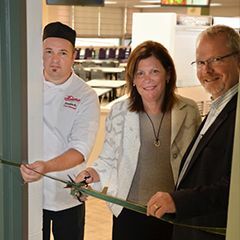 On August 31, 2017, Dana Hospitality officially re-opened the Balmoral Hall School Dining Hall. After an extensive renovation this past summer, the food service team is excited to present new, healthy options to the BH community. Additionally, the speed of service will increase with our new "grab and go" format. For the past few months, we have prepared extensively for International Independent Schools Public Speaking Competition (IISPSC). 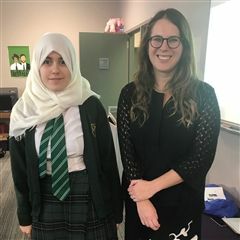 On October 19, we travelled with Mrs. Carissa (Nikkel) Balcaen '02 to Collingwood School in Vancouver to compete against more than 150 students from 11 countries around the world. This was an unforgettable experience, as none of us had ever participated in a public speaking competition to this extent. Throughout our time at IISPSC 2016, we were able to learn a great deal more about public speaking as we interacted with some of the best high school speakers in the world. Some of our favourite memories of this trip are meeting so many new people from places such as South Africa, England, Scotland, Hong Kong, Peru, Bermuda, and many other countries. We truly enjoyed learning about their homes, cultures, and journeys in public speaking. TECH AND THE FUTURE: SHOULD WE WORRY? On October 27, the junior competitive debate team attended a tournament at St. Paul’s High School. The resolution for this tournament was, “Be it resolved that this House believes technology will be beneficial for our future.” We worked together for two weeks prior to the tournament, brainstorming the various aspects of this challenging resolution. When you are the opposition for the concept of technology that encompasses so many different elements, you have to prepare for every potential permutation of the term. You continue to wonder what you will actually encounter from the government in terms of a definition for technology until it is time to debate. Our preparation ensured that we were ready for whatever was in store for us. Prime Minister Justin Trudeau announced a total of nine new, non-partisan appointees to the upper house on Thursday. The three new Manitobans named to the Senate -- Winnipeggers Patricia Bovey, Marilou McPhedran and Harvey Max Chochinov -- give the province a full complement of six members again for the first time since March 2013. The nine named from across Canada Thursday are the first senators to be chosen under an arm's-length process that saw more than 2,700 Canadians apply to fill 21 vacancies in the Red Chamber. I was fortunate to represent Balmoral Hall School in my favourite way, attending Canadian Student Leadership Conference (CSLC), during the last week of September. I am a Grade 12 student who has now attended four leadership conferences, two of which were strictly for Canadian independent schools, and two with most high schools across Canada. This year, I travelled with Mrs. Mandy Green, Student Activities Coordinator, and two of my peers to the cold but beautiful Edmundston, NB. In our first career awareness presentation of the year, Grade 8 students heard from Major Amanda Aldous '02, who is a Royal Canadian Air Force Logistics Officer. Major Aldous described her progression from Balmoral Hall School to Royal Military College of Canada, studying political science, and then to Dalhousie University for her Master of Public Administration. She also shared experiences from her training and deployment with Canadian Armed Forces. Experiential learning week was full of new places, new experiences, and new ways of seeing the world around us! After three weeks of preparation, Balmoral Hall School's junior competitive debate team participated in the first debate tournament of the year on October 5. The tournament proved to be very exciting as we debated that "Edward Snowden is a hero." Important themes such as national security and the infringement of privacy were discussed. 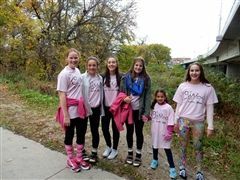 Each year, BH girls from Child Care to Grade 12 share their commitment to women's cancer awareness by inviting neighbouring students and teachers in grades 4 to 6 from Mulvey School to join them on a community walk. Lois McGill, Director of Academics at Balmoral Hall School, is a contributing author in this month's edition of Canadian Teacher Magazine. In her article, Lois discusses the importance of teaching students to think about, and to help others both close to home, and around the world. Middle School BH girls shared their experiences with new students at a welcome gathering in early September. When I look outside and see the leaves are just beginning to change color, the weather is starting to dip a little cooler and the morning drive is that much darker, it’s a sure sign that fall is arriving. The arrival of fall means in child care we say good-bye to some special friends and hello to new ones. It has always been a bittersweet time. Grade 12 student Hayley Smith wrote the winning entry in University of Manitoba's SET Day Essay Competition. SET Day, held annually at the university, celebrates science, engineering and technology, inviting high-school students to visit and explore the diversity of available disciplines open to a student with an interest in science. As a university preparatory school for girls, Balmoral Hall School offers its students unique opportunities to excel in the classroom. With a variety of Advanced Placement (AP) courses timetabled each year, students benefit from an educational experience that encourages them to reach their post-secondary goals. Of the 36 graduates of Balmoral Hall School's Class of 2016, 92% attempted at least one university level course through their Advanced Placement (AP) studies. Annually in spring, The College Board facilitates the writing of Adavanced Placement (AP) examinations so that students are able to obtain university credit. Leah Bernhardt '15 is the subject of a spotlight video by St. Boniface Hospital Research, as part of their "This is..." student series. Congratulations, Leah. We can't wait to see all the great things you'll continue to do! 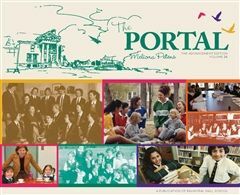 Read this year's Portal Magazine! 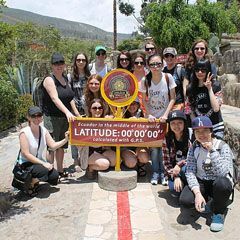 The Advancement Edition includes some outstanding stories about Alumnae adventures abroad, reflections on lifelong learning by a former teacher, and of course, the Crestlines! This year, we have been fortunate to receive a grant from Manitoba Arts Council's Artists in the Schools Residencies Program. This has allowed us to welcome Ms Lasha Mowchun, who has introduced students to many image-capturing technologies, including: Super 8mm and digital stop motion filmmaking; low-tech photography processes inspired by traditional black and white dark room photography; script writing; general filmmaking techniques; and editing short films. Patrons of Sifton Family Theatre may have recently noticed a transformation in the atrium. 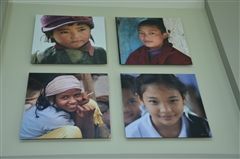 Thanks to Keith Levit, a professional photographer who is the father of three BH girls, a series of photos now adorns much of the wall space. This one-of-a-kind exhibition, "Girls of Our World," features more than two dozen photographs of girls Mr. Levit has met through his world travels in the last 25 years. "We encourage all girls to try when learning is hard. 'Take that challenge,' we say. Students are developing skills to bring them closer to success in pursuit of their goals," notes Rita Trautmann, Centre for Learning Coordinator at Balmoral Hall School. 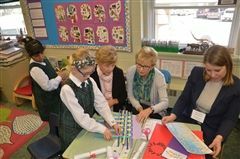 This past Friday, April 29 the school hosted our Annual Grandparents Day. We had our largest attendance to date with 370 family members coming through the doors to see their loved ones!!! Guests were treated to amazing finger foods & dainties courtesy of Dana Hospitality (our on-site food services provider) while they got to watch the hour long show consisting of singing and dancing that our talented students put on for them. Following the show all grandparents were escorted to their respective classrooms where they got to spend the last hour of the day learning and having fun in the classroom with their granddaughters. As it is every year it was a successful and special day for the school. 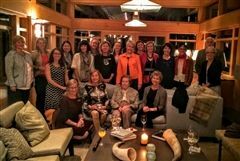 On April 15, Balmoral Hall School Class of 1986 began their reunion weekend celebrations with a wine and cheese on campus. 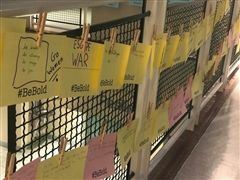 Many in attendance had not previously returned to the school since the day they graduated, and a lot has changed on campus. Others had not connected since their teenage years, and the reunion between friends, as well as teachers and staff, was memorable. Earlier this month, we organized our first "Tastes of the World" cooking class at Balmoral Hall School. This class is designed to teach life skills while offering a team-building opportunity for boarders. For the inaugural lesson students learned how to make a bannock taco, which is an Indigenous favourite in Canada. Having fun in the kitchen, students were keen to discover the traditional bread! Each week, "Tastes of the World" features new international cuisine, including Chinese, Japanese, Mexican, German, Nigerian, Spanish, and others. Keep reading for more cooking updates! April 22 is Earth Day, and Balmoral Hall School is encouraging eco-friendliness in many ways. From campus cleanup to litterless lunches, we are thinking greener this spring. Students are reusing water bottles, reducing food waste, and, notably, recycling plastic bags. BH Beginnings is honoured to be the recipient of Manitoba Child Care Association's Educaring Award in 2016 for its partnership with Balmoral Hall School, recognizing our shared commitment to communication, collaboration, and consistency. To say that the past few years of my life have been a whirlwind would be an understatement. Walking through the doors of Balmoral Hall School as a Grade 9 student, I could never have dreamed where my life would lead. If someone had told me that in four years, I would be playing Division I hockey at an Ivy League school, I don’t know if I would have believed them; this is mostly due to the fact that I had no idea what an Ivy League school was at age 14, and yet here I am. Really, it’s hard to believe that eight months ago I packed up to move halfway across the continent, following my dreams. When the time came, I was as nervous as anyone moving away from home for the first time, but once I stepped on campus I knew this is where I belong. By now, Dartmouth has become my home. Have you ever witnessed a most unexpected moment becoming a really profound one? This happened during spring break. As I wrote previously, students and teachers brought in four green, white, and black striped caterpillars last fall, and we have continued to observe their metamorphosis to swallowtail butterflies. A couple of weeks ago, the fourth butterfly emerged from its chrysalis. 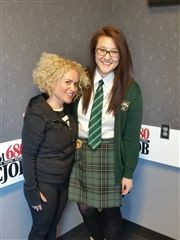 On March 3, Gillian Chiu, Grade 11, was invited to visit the Dahlia Kurtz show on CJOB 680 Radio in Winnipeg. In a twist from the traditional format, Gillian was invited to take the role of interviewer, and ask Dahlia questions about her career in media. Listen to the segment below. Great job, Gillian! 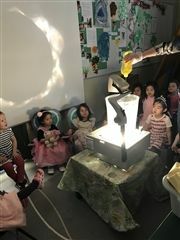 On March 9, Kindergarten students were treated to a morning workshop introducing them to circuits, robotics, and more. Douglas Thomson from University of Manitoba and Richard Bernhardt from National Research Council showed us some simple circuits and then worked with us to build a simple robot using a toothbrush, battery, and motor plus wires. The vibration of the motor propels the bristles of the toothbrush, producing a scurrying BrushBot. Celebrating International Women's Day 2016 at Balmoral Hall School. We began our day with a compelling monologue reading of the work of Nellie McClung who, 100 years ago, helped secure the right to vote for women in Canada. Thanks to Arts Prefect Alex Chubaty Boychuk for her impassioned reading! Balmoral Hall School has long been a forum of critical, creative thinking, and this has been evident as of late in increased community awareness; February has been a month of activism with students taking action to make a difference in their city, in their country, and in their world. 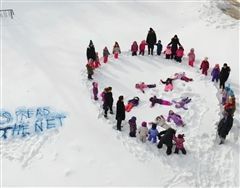 From Plan Canada's Spread the Net Student Challenge to a memorial art installation led by Fariba Ishrar, a Grade 11 student who is studying Indigenous issues, Balmoral Hall School's classrooms, hallways, and offices are buzzing. Now, local news leaders, international changemakers, and many others are joining these conversations. Below is an outline of recent media relations. 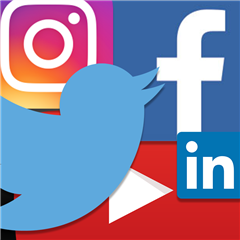 Engagement on Balmoral Hall School's social media furthers these efforts. Thank you for your consideration. Last week, on Monday, February 8th, 11 per cent of the Balmoral Hall population celebrated the most important holiday in their culture, Chinese New Year. Chinese New Year's Day is the first day of the lunar calendar and on the Gregorian calendar it usually falls sometime between January 21st and February 20th. The holiday is celebrated with the exchange of little red envelopes of money, fireworks and lots of family time. It is no wonder a lot of our Chinese students find themselves feeling a little homesick at this time of year. In All I Really Need To Know I Learned In Kindergarten, Robert Fulghum writes, "Most of what I really need to know about how to live and what to do and how to be I learned in Kindergarten." Yesterday, I was reminded of this as I spent the day with Mrs. Arda Thomson's Kindergarten class. As an often unseen member of Balmoral Hall School's administrative staff, opportunities to interact with students are rare. However, when I decided to observe a day in the life of a five-year-old BH girl to further my work in Communications, I was welcomed. 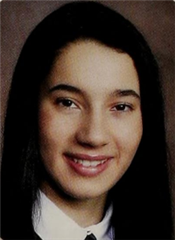 Carla Pienaar graduated from Balmoral Hall School in 2001. Since then she has earned a Bachelor of Commerce (Hon.) from University of Manitoba. However, her passion is for design. Through education in industrial design at Emily Carr University in Vancouver as well as her current educational experience as a Master of Interior Design candidate, she works in the areas of product and interior design. 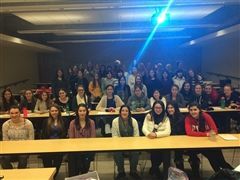 On January 13, we had the pleasure of meeting Professor Marilou McPhedran from University of Winnipeg’s Global College, as she presented to a combined group of Girls for the World and Youth in Philanthropy members. Staff began observing that the children were taking some items off the shelves to line them up in a strategic manner. Although we were unsure of their intent, we were certain of their interest as they resumed this activity throughout recent weeks. In true Reggio Emilia fashion, we discussed their intent and interest during one of our staff meetings. In 2011, Louis R. (Bud) Sherman, husband of Elizabeth Ann (Beaton) Sherman RIV Gr. 11 '49, founded Balmoral Hall School's Dr. W. Grant Beaton Lecture Series in honour of his father-in-law, a former chief of surgery at Misericordia Health Centre. "I wanted to do something that was meaningful for the school in commemorating my wife," the late Mr. Sherman said in an interview for The Portal in 2014. "It's a very exciting time to be at a school like this." Enriching university guidance at Balmoral Hall School, the lecture series fosters an interest in the sciences. At Balmoral Hall School, we promote community and global awareness in our students through volunteerism, and encouraging our girls to become active in causes they are passionate about. "People who step out of their comfort zone, people who fail, but don't give up - those are the students who do well in college and do well in life." During a professional development opportunity I attended this year, I had the extreme pleasure of hearing keynote speaker, Salman Kahn, developer of Khan Academy. He delivered a humorous, inspiring and humble presentation about his philosophy on education and the fundamental purpose behind Khan Academy. In December, Grade 10 students visited University of Manitoba on a program exploration field trip. Students will be visiting the university twice this year in an effort to see, first-hand, what programs and university class environments look like. On our first excursion, we visited the faculties of nursing and engineering. We are excited to announce that Dr. Peter Markesteyn will be this year’s keynote speaker for the 4th annual Dr. W. Grant Beaton Lecture Series. Dr. Peter Markesteyn was born, raised, and educated in The Netherlands. 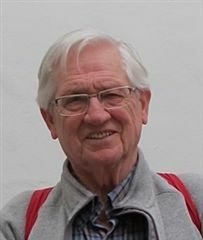 In the early 1960s, he came to Canada to practice medicine and then to Scotland to study Pathology. He subsequently held positions in the field of forensic pathology in Newfoundland, Alberta, and Manitoba. “There is something profoundly different in how a graduate of Balmoral Hall School holds herself. With a commanding presence about her, she is proud to have successfully tested her intellectual, athletic, and artistic mettle in a rigorous learning environment. The legacy left to me (as an alumna) is to recognize that privilege, wield it to find every opportunity to give back to the community, and help others as much as possible”, said Andi Sharma ’03 as she reflected on her days at BH during an interview for a feature article in the 2015 issue of The Portal magazine. Donations to charitable organizations are a good way to reduce the income tax paid on your return. Across Canada, more than 1/3 of all charitable giving occurs in the last three months of the year. 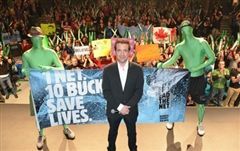 Misericordia Health Centre Foundation invited us to help them break a Guinness World Record for “The Largest Gathering of Angels,” and the record to beat was set in 2009 in Germany with 1,039 participants. The record attempt took place in the playground of Mulvey School on December 1. "A night to remember," remarked an attendee at the inaugural Fall Family Dinner hosted by Balmoral Hall Parent Association last Saturday night. Lights and shimmer created the ambiance for a wonderful dinner catered by 295 York as families mingled throughout dinner. Truly, the highlight of the evening was a performance from talented BH girls (dancers and artists alike) who took centre stage with confidence, poise, and grace; at the end of the night, student artwork was raffled off to several lucky winners. On Tuesday, Hilary Potts from Ivey Business School and Eric Jensen, Ivey alumnus and the parent of a BH girl, delivered a presentation about the incredible experience of studying at University of Western Ontario. On October 29, junior debaters participated in their first tournament. Debating the resolution: "This House Would Continue our Use of Resources for Space Exploration," we were able to consider the benefits, harms, and costs of this resolution. 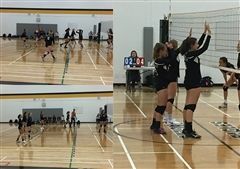 This event was not only the first tournament of the year, but the first tournament for Grade 7s and the first open tournament for most of the Grade 8s. The girls began their weekend with a walk around the neighborhood, admiring the falling leaves amid lots of park fun in the beautiful October sunshine before heading back to residence for some chocolate strawberries and fairy bread supplied by our Australian "Gappers." You are encouraged to exchange ideas with Balmoral Hall School's Board of Governors Wedenesday, November 18, 2015 during our Annual General Meeting to be held at 7 p.m. in Sifton Family Theatre. This is a fantastic opportunity to ask questions about the strategic vision of the school. We hope you are able to join us. Without the engagement of all Balmoral Hall School families, it would not have been possible to impact CancerCare Manitoba Foundation's Guardian Angel Benefit for Women's Cancer as Girls for the Cure has, raising $373,000 in 15 years. This year, alone, you raised nearly $16,500! Thank you, again, for your support. Love what you learn, and learn what you love. Create a culture of learning in your home. Embrace that an optimum level of stress motivates us to perform well. Middle and Senior School students and parents heard this and more on October 1 from Clinical Support Services reading clinician Carol Hryniuk-Adamov as well as social worker Carmen Bergeron. They provided strategies for learning with greater efficiency and increased resiliency. I recently asked my father if we have a relative who died in 1915 during WWI, and this was his reply. 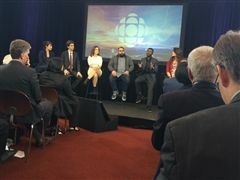 CBC/Radio-Canada held its Annual Public Meeting in Winnipeg on September 29, and representatives of Balmoral Hall School were pleased to attend this thought-provoking event. I was joined by Grade 11 students Katherine Burley and Maya Schwartz, who volunteered as greeters prior to the meeting. 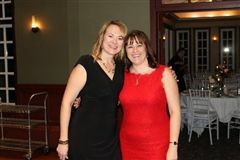 Also attending the event were Executive Director Tina Alto and Recruitment Specialist, Adele Stevens, a former CBC employee. This was the consensus of discussions among faculty, staff, and parents at Balmoral Hall School, as they met with educational consultant Ken O'Connor on September 28. Specializing in assessment research, he shared his perspectives with us throughout scheduled professional development exercises last Monday. This was an excellent opportunity to think critically about assessment and its purpose at a university preparatory school for girls. One of my favourite times of year is when Nursery students begin school. In most cases, they have observed the previous year's group as they went off to their Nursery activities. During the summer, they are told that soon they will be the "Nursery girls" who will be going to dance and library classes, attending morning meetings, and completing homework in the form of nightly reading. As I flew to Vancouver last week to attend the most recent Balmoral Hall School Foundation event, I must admit that I had no idea what to expect. Yet, I flew home with an overwhelming feeling of success and a strong belief in the school’s future! Cheques were written, and then one alumna offered to match, dollar for dollar, funds raised that evening. Middle and Senior School (Grade 6 +) students and their parents are invited to attend Making Your Mark, A Study Skills Session, presented by Carol Hryniuk-Adamov at Balmoral Hall School Thursday, October 1 from 7–9 p.m. in Sifton Family Theatre. Dana Hospitality is very pleased to be providing hot, healthy meals to the entire Balmoral Hall Community for the 2015/2016 school year. Please note that we have made some changes to the payment for our program to improve the customer experience in the cafeteria, as well as reduce the amount of extra paperwork by our administrators. Grade 6 student Adi Groumoutis has been selected as a finalist in Canada's young Citizens competition. 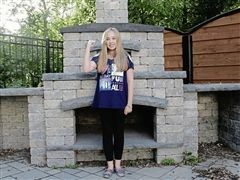 She will receive a free trip to Ottawa, along with 25 other finalists (two from each province and territory) to participate in the Canada’s History Youth Forum. This is a song loved by current BH girls and alumnae alike. I remember singing this song as a child when I enrolled at Balmoral Hall School in Grade 3. Proudly, I continue to sing it at assemblies still as alumnae relations coordinator. It brings back very heartwarming emotions, provoking memories of my 10 years at Balmoral Hall and the friendships that I still cherish today. BH Grad a guiding light. If you have been a member of Balmoral Hall School's community at any time within the last four years, chances are you have heard the name Jing Lin (Annie) Luo many times. 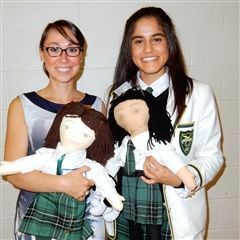 Since enrolling as an international boarding student in Grade 9, she has been involved in almost every extracurricular opportunity offered at one time or another. In light of this Winnipeg Free Press article from May 6, you may be wondering about the ECERS-R score that BH Beginnings received. Why is the river changing? 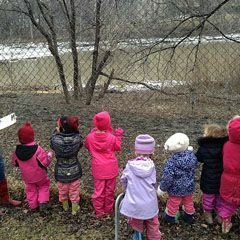 Our child care staff, noticing the interest the girls had in the changing river decided to make that the focus of a new Reggio Emilia / IB PYP project. 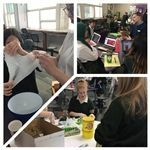 After several months of research and experimentation, seven Grade 8 students, participated in the three-day Manitoba Schools Science Symposium.